MANAGUA, May 11 2018 (IPS) - Assaults on journalists, persecution of press workers’ unions, direct censorship and smear campaigns are a high cost that freedom of expression has paid in Nicaragua since demonstrations against the government of Daniel Ortega began in April. It is the culmination of “a process of degradation of the practice of journalism and of freedom of expression” during the 11-year presidency of Ortega, a former Sandinista guerrilla, Adrián Uriarte, the dean of the Faculty of Social Sciences of the University of Commercial Sciences, told IPS. In his view, the stifling of free speech by the government of the leftist Sandinista National Liberation Front (FSLN) is almost as bad as it was during the worst years of the Somoza family dictatorship (1934-1979). They also demanded an independent investigation into the violent events that have occurred since the Apr. 17 start of the protests, which are still continuing but are less virulent. They recalled that the toll so far is at least 47 people killed, more than 400 injured or detained and serious damage to journalists, as well as the destruction of media equipment. On Apr. 9, Managua was the scene of a massive demonstration by students, peasant farmers and civil society organisations demanding justice and democracy. It took place without incident, and for the first time the government countered with a demonstration by its supporters. Uriarte said that since Ortega returned to power in 2007, he established “an exclusionary communication policy” that provided all the facilities and support of the State to “the citizen power media” and vetoed access to information and the exercise of independent journalism for other media outlets. stations, print media, and the proliferation of online portals, while independent media outlets were being closed and economically stifled by the implementation of fiscal measures and the withdrawal of state advertising. “That gradually undermined the quality of freedom of expression and the exercise of journalism,” said Uriarte, who added that this has peaked since the beginning of the current wave of protests. The trigger for the outbreak of civil unrest in the streets was a decree for social security reform, which increased contributions and reduced benefits, and which Ortega revoked on Apr. 22, in an attempt to defuse the crisis. Uriarte has documented a series of direct attacks on journalists from three opposition media outlets: the radio station Onda Local, the newspaper La Prensa and the subscription TV news channel 100% Noticias. “But the loss with the greatest impact was the murder of journalist Ángel Gahona and the harassment of journalist Ileana Lacayo in Bluefields, as well as the illegal detention of reporter Salomón Manzanares in León. “These events show that in Nicaragua we have gone from indirect to direct censorship, a method that was believed to be already overcome in Nicaragua,” he said. Gahona was killed by a bullet to the head on Apr. 21, in the early days of the protests, in Bluefields, capital of the eastern South Caribbean Coast Autonomous Region, when he was covering the protests in that city and his death was recorded live. The National Police has arrested and accused two black teenagers, but the victim’s family rejects the official version and blames members of the police. “Other acute symptoms against free speech have been the series of events that go from the destruction of Radio Darío (in the western city of León), to the attempt to set fire to the pro-government Radio Ya and the burning of a vehicle of Channel 8, owned by Juan Carlos Ortega Murillo, son of President Ortega and Vice President Rosario Murillo,” Uriarte said. Anibal Toruño, director and owner of the Radio Darío station, told IPS that the burning of the station during the April protests in León was organised and led by Sandinista leaders with the intention to kill the entire team of 12 journalists and technical staff covering the “purple protests”. The explosion, said Toruño, “set the place on fire. But the journalists, with the help of neighbours, were able to escape through a door that led to an adjoining house.” In the attack two of the assailants died when they were overtaken by the flames. The police have not launched an investigation, and have not even taken statements from the victims of the attack, he said. This is the second time under this government that the station was attacked. In 2008, a group of Sandinista ex-combatants broke into the station, during another wave of protests over the allegations of fraud in that year’s election campaign, and destroyed the station with baseball bats and stones. No official investigation was carried out into that attack either, said Toruño. Luis Galeano is the director of the radio and television programme Café con Voz and has suffered government censorship for his independent thinking. His programme is broadcast on the 100% Noticias news channel, owned by journalist Miguel Mora. Mora has denounced that Orlando Castillo, director of the governmental Department of Telecommunications and Postal Services, summoned him to his office on Apr. 19 to inform him of a presidential order to “stop broadcasting news about the protests”, to close down Galeano’s programme, and to fire him as well as another commentator. After rejecting these demands, the channel went silent for several days, until business leaders and the Catholic Church managed to put it back on the air. “I had never experienced such an adverse experience as this,” Galeano, who has been a journalist since 1996, told IPS. This is the first time he has faced the direct aggression of a president through government institutions. Another journalist who has suffered censorship and repression is Martha Vásquez, a legal reporter for the newspaper La Prensa, the oldest in the country and openly critical of Ortega’s government. Vásquez has been denied access to judicial facilities, expelled from public events, and threatened by court officials, while she has been a victim of anonymous smear campaigns. Gustavo Bermúdez, president of the Nicaraguan Journalists Association, told IPS that the exercise of free speech and journalism “has reached a low point from April to this date,” after 11 years of growing repression and censorship against the independent media. He says that more than 100 radio and television stations have disappeared because of the censorship and the government’s oppressive economic policy towards the media, more than 20 journalists have emigrated in search of better horizons, and at least 30 more have ceased to practice their profession. “During 11 years in office, President Ortega has never given a press conference. The police and the regime’s security bodies prevent access to cover any type of government activity by journalists from independent media and foreign correspondents, who in addition to this, have their equipment confiscated,” he protested. Ortega, 73, is in office for his third consecutive term, which began in 2017 and is to end in 2021, thanks to a controversial constitutional reform. Before that, he ruled the country as part of the Sandinista Junta of National Reconstruction (1979-1985), after the Somoza dictatorship was overthrown, and as president from 1985-1990. 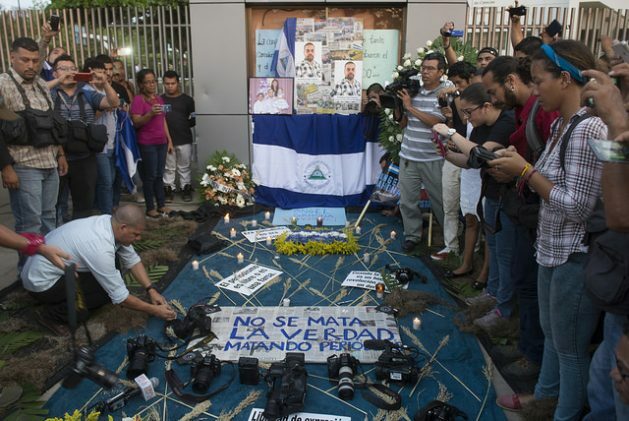 Leonel Laguna, president of the Nicaraguan Journalists Association, also issued a statement following the death of Gahona, in which he condemned the violent actions against journalists in the exercise of their profession and against citizens in their right to freedom of expression.